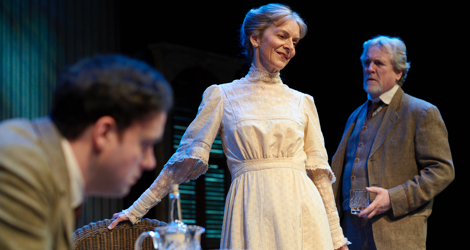 In 1994 the Stratford Festival had a massive critical and popular success with Eugene O’Neill’s autobiographical family drama Long Day’s Journey into Night. Director Diana Leblanc had an ideal cast with William Hutt as the father James Tyrone, Martha Henry as the mother Mary, Peter Donaldson as the elder son Jamie, Tom McCamus as the younger son Edmund and Martha Burns as the maid Cathleen. The play was remounted the next year and was eventually made into a film by David Wellington in 1999 based on Leblanc’s production and using the same cast. Now, after years of fending off invitations to direct the play elsewhere, Leblanc has directed it for Soulpepper, and the results are distinctly mixed. Sometimes all elements of a production come together in a way that imply cannot be reproduced. That magic happened in 1994. It does not happen now. The primary factor is that the cast is not as strong. Leblanc now has Joseph Ziegler as James, Nancy Palk as Mary, Evan Buliung as Jamie, Gregory Prest as Edmund and Krystin Pellerin as Cathleen. They all give perfectly adequate performances, but while the Stratford production was a harrowing, emotionally draining experience, the Soulpepper production is dangerously unengaging. One element in this is that Soulpepper has elected to present the play on a proscenium stage. At Stratford it was played on the long narrow thrust stage of the Tom Patterson Theatre that created a much sense of intimacy rather than distance. More important, however, is that the Soulpepper production is only three hours long including one intermission. The film of the Stratford production is 172 minutes long and, of course, has no intermissions. In the theatre the production had two and ran nearly four hours long. The timing is significant, not merely because the title suggests it should be so, but because the play is structured in a series of repeated patterns that need to build up slowly to create a sense of inevitability. When the dialogue is sped up as it is here, one nuance after the other is lost and the pattern stands out rather than the content. In the Soulpepper production, Leblanc presents the first three acts of the four-act play before the single intermission. This divides the descent of the Tyrone family into a long set-up and a conclusion. When there are two intermissions, we experience the descent in two stages--hope among the men that Mary has not relapse into her morphine addiction and then acknowledgement that she has--before the final despair of the fourth act. In the haste to get through the first three acts before intermission, significant pauses go missing and the actors often don’t have the time to give O’Neil’s words and phrasing the weight they should have. Mary’s important statement, “None of us can help the things that life has done to us” needs to stand out rather than be whisked into the general mix of dialogue. The entire Tyrone family is under pressure both because of fear that Mary has returned to her addiction and of fear that Edmund does not have a “summer cold” as Mary wishes to believe but consumption. Each of the family member has known and secret grievances against the others. The play’s structure depends on characters inadvertently blurting out a truth or complaint only to retract it or apologize in order to create a façade of peace, peace deemed essential for Mary’s recovery after her return from a sanatorium. These cycles of recrimination and retraction have to escalate gradually until drink and drugs finally lay waste to all illusions and characters speak out whatever they’ve tried to conceal no matter how hurtful. The Soulpepper production begins on too high a pitch with characters already shouting at each other in the first act leaving little room for the gradual escalation of increasingly cutting accusations to come. Only when we arrive at the Act 4 do we sense that the rush through the text is over, and it is no accident that this is the most effective part of the production. Ziegler has given many fine performances at Soulpepper. What eludes him that was second nature to William Hutt is that Tyrone is at basis an actor and that it is often difficult to know when he is acting and when he is not. Even the basic truths Hutt uttered he made sound like gilded stories, something that Ziegler never achieves. The virtue of Palk’s performance is that she links Mary’s erratic behaviour early on to the girlishness of the convent days she cherishes so much. Palk switches rapidly from mood to mood rather than adopting Martha Henry’s subtler technique of establishing a mood from which Mary makes strange outbursts only to retreat again. Henry was also more effective in suggesting the gradually increasing numbing effect of the morphine throughout the course of the play. Buliung nearly rivals Peter Donaldson’s great performance, making it clear from the beginning that Jamie is being eaten up from inside by self-loathing. His great tragicomic drunken confession to Edmund in Act 4 is the highpoint of the play. Prest communicates Edmund’s fundamental innocence but not so fully the immature morbidity that underlies it. He does rise to the occasion in Act 4 and his best moments are his fury at James, followed by a wry understanding of a man who has help ruin his family’s lives. Pellerin is pert enough as Cathleen but she could suggest that she knows more about Mary’s habit than she lets on. One plus in Leblanc’s approach to the play this time around is in making clear the hypocrisy of the male family members in their decrial of Mary’s addiction. Mary retreats into the fog of her addiction because that is the only way she can blot out a painful past she can never forget. James, Jamie and Edmund do exactly the same thing for the same reasons only their drug of choice is alcohol. What Leblanc shows in the Soulpepper production is how much the men want Mary to be an ideal for them to give them some hope for themselves. Her return to addiction becomes for them the external manifestation of a general loss of hope. The Soulpepper production is good enough that anyone coming to the play for the first time will still feel the play’s power. Anyone, however, who saw the play at Stratford or Wellington’s film, will realize that the Soulpepper production simply does not plumb the full depths of the work or build, as it should, to an overwhelmingly devastating, unforgettable climax. Photo: Gregory Prest, Nancy Palk and Joseph Ziegler. ©2012 Michael Cooper.